Khiva—Let’s go shopping | Where to next? About 70 per cent of the time, we reach a town, campground or bush camp a bit before dark (and sometimes long after dark). Khiva was one of our long, long after dark arrivals. In order to park off the road, Will, our driver, had to manoeuvre the truck through the local market, to a spot not too far from the hotel. This effort took skill, patience and a lot of hands. The market is set up in a small and rather narrow space, so some market ‘furniture’ had to be moved before the truck could be ‘put to bed’. The bonus in all this was that the next morning, we knew exactly where to find the market. I love markets. I love to see the food and anything food-related. 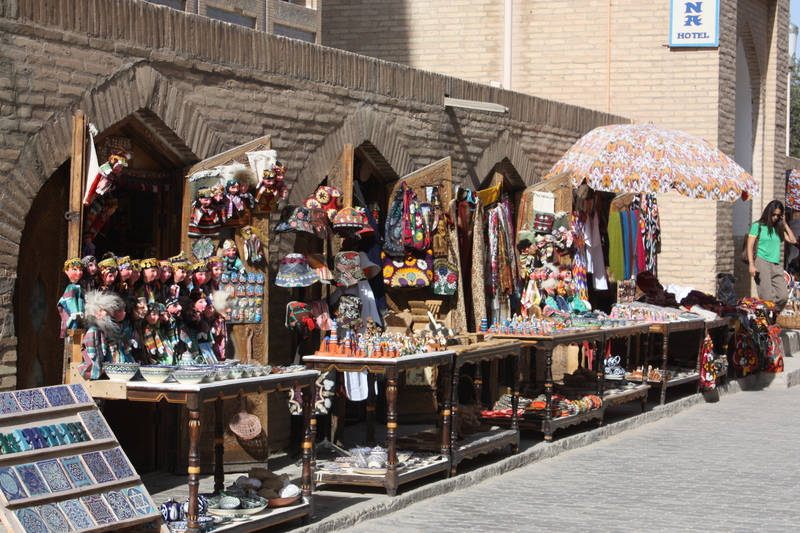 Khiva’s market was especially basic. No permanent structure, just a laneway where delivery vans parked or tables were set up. Most food goods were spread on the ground. Souvenirs are treated with more respect. They are the big money earners, so are hung on racks or spread out on tables. Many of them even have shade cloths and umbrellas to protect them (and/or shoppers) from the blazing sun. That said, it’s hard to convince yourself to buy a fur hat when the temperature exceeds 30°C. Weaving and appliqué are popular, too. Souvenir stalls are scattered all over the city, and tucked into some of the touristic sites too. There even was a mini market at the Juma Mosque. I loved the style of the music vendors on the street. They were dancing to the music they were selling. I tried to get a photo, but the crowd was impenetrable. I’m not an avid shopper—except for food—so wasn’t moved to buy anything, but there were lots of temptations. 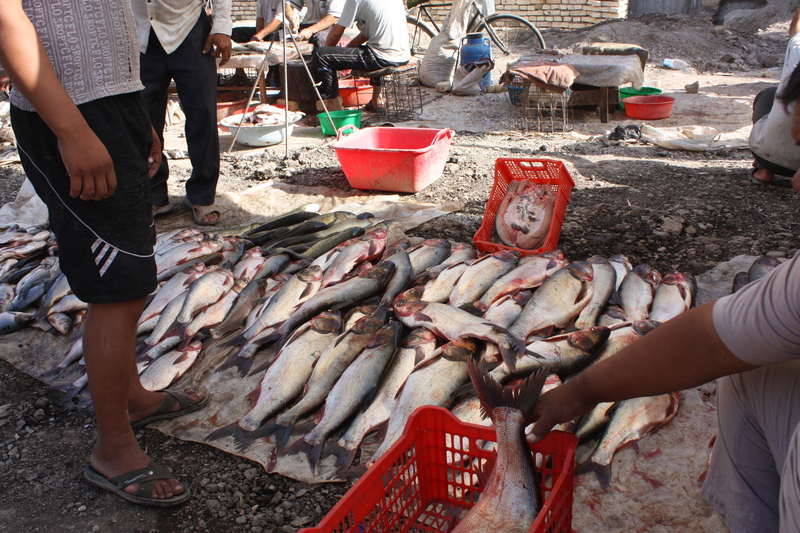 If you ever get to Khiva, have a good look at the array on offer. Also: Don’t forget to pick a number by 29 February 2012. Road works in Uzbekistan « Where to next?